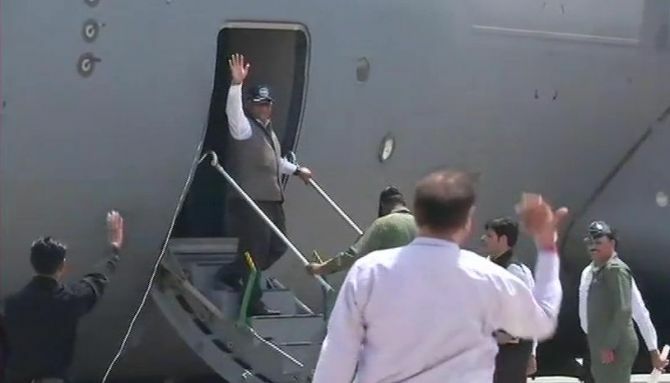 Minister of State for External Affairs V K Singh on Sunday left for Iraq to bring back the mortal remains of 38 out of 39 Indians, killed in the war-torn country, officials said. The minister is expected to bring back the bodies by Monday. "The minister left around 1 pm from the Hindon airbase and is expected to return with the bodies tomorrow," an official said. After coming back, he will first go to Amritsar followed by Patna and Kolkata to hand over bodies to their relatives, official sources said. "I am going to Mosul to get mortal remains of 38 Indians. We won't get one man's remains as his case is pending. We will hand over coffins to the family members with evidence so that they have no doubts about it. My deepest condolences to the families of the deceased," Singh said before leaving. Families of some of these victims had met External Affairs Minister Sushma Swaraj here on March 26. Earlier this month, Swaraj had told Parliament that as many as 40 Indians were abducted by terror group ISIS from Mosul in Iraq in June 2014, but one of them escaped posing as a Muslim from Bangladesh. The remaining 39 Indians were taken to Badoosh and killed, she had said. Meanwhile, authorities in Amritsar are making the required arrangements to receive the bodies expected to arrive by a special aircraft on Monday afternoon, a senior official said. "All necessary arrangements have been made to transport the mortal remains of 31 Indians killed in Iraq, who hail from different places in Punjab and Himachal, to their native places when the bodies reach tomorrow," Amritsar Deputy Commissioner Kamaldeep Singh Sangha said on Sunday. Of the Indian citizens killed by the terrorist organisation, 27 belonged to Punjab while four hailed from Himachal Pradesh. "As per the information we have received, the bodies are expected to reach the international airport at Amritsar at around 1:30 pm tomorrow," Sangha told PTI over the phone. According to the schedule, Union minister Singh will reach Amritsar followed by Patna and Kolkata to hand over bodies to the relatives, officials said. Sangha said he held a meeting on Saturday with various stake-holders involved in the process of smooth handing over of the bodies to the relatives. "Those who took part in the meeting included director of the Amritsar international airport, officials of the customs, immigration, CISF, police, IAF and bureau of civil aviation," he said. The Amritsar DC also spoke to his counterparts in other districts in Punjab and Himachal Pradesh. Arrangements for ambulances and other vehicles for ferrying the coffins to the native places have been made by the respective district administration with all necessary assistance extended by the authorities in Amritsar, he said. "As it is a sombre occasion and to ensure that no inconvenience is caused to the grieving relatives, we have made arrangements so that there is no chaos at the airport. The bodies will be brought out from a different exit passage," he said. Eight victims belonged to twin districts of Amritsar and adjoining Tarn Taran. Family members of the 39 Indians massacred by ISIS were still trying to come to terms with the grim reality. Dimplejeet Kaur, sister of Dharminder Kumar, 27, said he was the sole bread winner supporting a large family. "All our hopes are dashed now; we are heart broken," she said. Kumar went to Iraq to earn for his family in 2014. He was a resident of village Talwandi Jhira in Gurdaspur district. Among the 39 Indians, most were from different places in Punjab like Amritsar, Gurdaspur, Hoshiarpur, Kapurthala and Jalandhar. Speaking to reporters on the sidelines of budget session of the state assembly over a week ago, Punjab Chief Minister Amarinder Singh had promised adequate compensation by the state government for the families of the Iraq victims. He also demanded that the Centre also compensate the victims since the tragedy occurred overseas. Has India washed its hands of the 39 hostages in Iraq?